Cuppa tea and Pudding…happy as a pig in muck. Pud Inn, bringing community together in support of the Whirlow Hall Farm Trust and Sheffield Hospitals Charity. Being Yorkshire born and bred, I know a good get together when it’s at home, because the thing is, you can take the girls out of Yorkshire, but you can’t take the Yorkshire out of the girl! 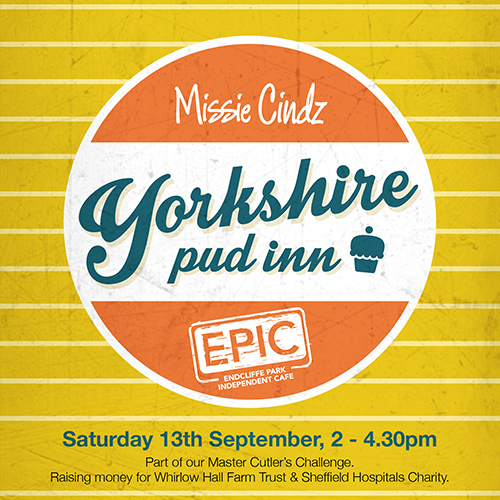 You are all invited to attend an afternoon of Yorkshire-themed puddings and entertainment hosted by myself and team Endcliffe Park Cafe – EPIC to raise funds for our Master Cutlers Challenge 2014. Serving a very special 5 course YORKSHIRE-themed desserts menu from talented chefs, including The Rutland Arms Chef Mike, Chef EPIC and Silversmith’s Chef Lee & others. Do we have to bring owt? Sweet Fun(d)raising: All proceeds from our Yorkshire Pud Inn event will go as ever to Whirlow Hall Farm Trust and the Sheffield Hospital Charity. This is a ticketed event and places are very limited, Pud Inn tickets are £10 per person and will be available to purchase at the Rutland Arm’s bar from Monday 18th August or via email booking from 7.00am (emailing is advised). Sorry but I won’t be able to reserve tickets before this date. Please do look out for more event details on this blog, twitter by following the hashtag #MissiesPudInn or by joining and liking our facebook event’s page.